هاشمی, سید جواد, ریاحی بختیاری, علیرضا, لک, راضیه. (1393). بررسی غلظت فلزات در رسوبات سطحی دریای خزر در امتداد نیم‌خط‌های کپورچال، بندرانزلی و کیاشهر. مجله آب و فاضلاب, 25(6), 47-56. سید جواد هاشمی; علیرضا ریاحی بختیاری; راضیه لک. "بررسی غلظت فلزات در رسوبات سطحی دریای خزر در امتداد نیم‌خط‌های کپورچال، بندرانزلی و کیاشهر". مجله آب و فاضلاب, 25, 6, 1393, 47-56. هاشمی, سید جواد, ریاحی بختیاری, علیرضا, لک, راضیه. (1393). 'بررسی غلظت فلزات در رسوبات سطحی دریای خزر در امتداد نیم‌خط‌های کپورچال، بندرانزلی و کیاشهر', مجله آب و فاضلاب, 25(6), pp. 47-56. هاشمی, سید جواد, ریاحی بختیاری, علیرضا, لک, راضیه. بررسی غلظت فلزات در رسوبات سطحی دریای خزر در امتداد نیم‌خط‌های کپورچال، بندرانزلی و کیاشهر. مجله آب و فاضلاب, 1393; 25(6): 47-56. 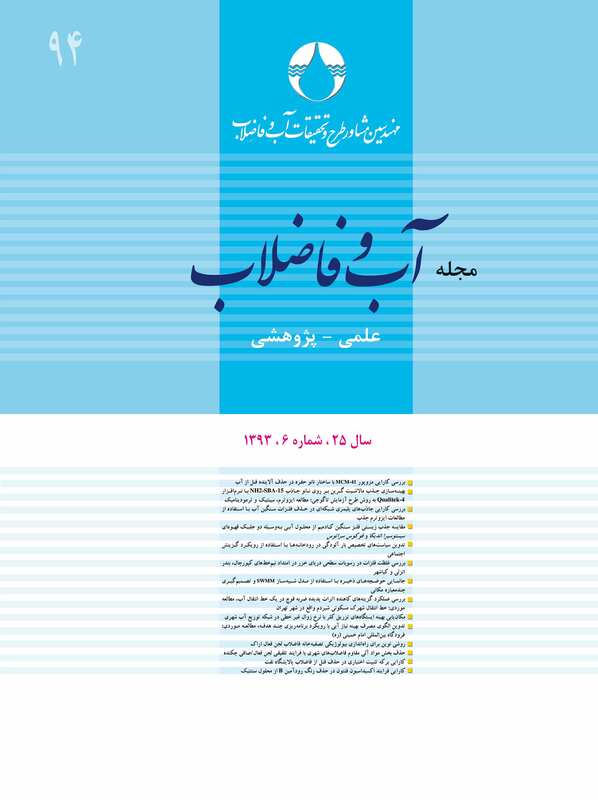 در این مطالعه به‌منظور بررسی پراکنش و تعیین منشاء فلزات سرب، مس، روی، نیکل، کروم و وانادیم در رسوبات سطحی سواحل جنوب غربی دریای خزر، نمونه‌برداری از رسوبات سطحی سه نیم خط کپورچال، بندرانزلی و کیاشهر در خرداد ماه 1391 انجام شد. غلظت فلزات توسط دستگاه ICP-OES تعیین شد. منشاء فلزات در منطقه طبیعی و ناشی از فرسایش خاک و سنگ‌های حوضه آبریز رودخانه‌های ورودی به دریا به‌دست آمد. میانگین غلظت کلی فلزات در امتداد نیم‌خط‌های مورد مطالعه با افزایش فاصله از ساحل، افزایش معنی‌داری را نشان دادند که می‌تواند ناشی از انتقال رسوبات با توجه به شیب ساحل در امتداد نیم‌خط‌ها باشد. همچنین میانگین غلظت کلی فلزات در امتداد ساحل، افزایش معنی‌داری را درنیم خط بندرانزلی نشان دادند، که از دلایل آن می‌توان به‌وجود تالاب انزلی با توجه به تعدد رودخانه‌های ورودی به آن و مجاری خروجی از آن به دریا اشاره کرد. همچنین غلظت کلی فلزات در رسوبات سطحی منطقه در مقایسه با استانداردهای جهانی SQGs و NOAA پایین‌تر بود. کد ارزیابی ریسک نیز برای فلزات مورد مطالعه، عدم ریسک و فقط برای سرب و مس، ریسک پایین را نشان داد. This study was conducted to determine the origin and distribution of the lead, copper, zinc, nickel, chromium, and vanadium metals in the surface sediments of the southwestern coasts of the Caspian Sea. Surface sediment samples were collected from the three transects of Kapourchal, Bandar-Anzali, and Kiashahr at three different depths of 10, 20, and 50 m. Metal concentrations were determined by ICP-OES. The metals in these areas were identified to originate from such natural sources as rock weathering and soil erosion transported by rivers into the sea. The mean total concentrations of the metals along the three transects showed significant increases with increasing distance from the shore, which might be due to the transportation of sediments as a result of increasing slope along the sampling transects. The same trend was observed in the samples taken from the coastal areas along Bandar-Anzali, which was could be due to the wetlands in the region and the multitude of rivers flowing into this wetland which eventually carried the sediments into the sea. Results revealed that the total metal concentrations in the region were below the SQGs and NOAA standards. Finally, risk assessment code did not show any serious risks, but indicated only a low risk due to lead and copper levels. 1. Muzuka, A.N.N.(2007). “Distribution of heavy metals in the coastal marine surficial sediments in the Msasani Bay- Dar es Salaam Harbour Area.” J. of Marine Science, 6(1), 73 - 83. 2. Berkowitz, B., Dror, I., and Yaron, B. ( 2008). Contaminant geochemistry: Interactions and transport in the subsurface environment, Springer Verlag, Berlin. 3. Pekey, H. (2006). “The distribution and sources of heavy metals in Izmit Bay surface sediments affected bay polluted stream.” Marine Pollution Bulletin, 52(10), 1197- 1208. 4. Hosono, T., Su, C.C., Delinom, R., Umezawa, Y., Toyota, T., Kaneko, S., and Taniguchi, M. (2011). “Decline in heavy metal contamination in marine sediments in Jakarta Bay, Indonesia due to increasing environmental regulations.” Estuarine, Coastal and Shelf Science, 92(2), 297 - 306. 5. Heltai, G., Percsich, K., Halász, G., Jung, K., and Fekete, I. (2005). “Estimation of ecotoxicological potential of contaminated sediments based on a sequential extraction procedure with supercritical CO2 and subcritical H2O solvents.” J. of Microchemical . 79(1), 231 - 237. 6. Perin, G., Craboledda, L., Lucchese, M., Cirillo, R., Dotta, L., Zanetta, M.L., and Oro, A.A. (1985). “Heavy metal speciation in the sediments of Northern Adriatic Sea-a new approach for environmental toxicity determination.” International Conf. of Heavy Metals in the Environmental, University of Cafoscari, Vinizai, Italy, 2, 454-456. 7. Kosarev, A.N., and Yablonskaya, E.A. (1994). The Caspian Sea, SPB Academic Publishing, Hague. 8. Effimoff, I. (2000). “The oil and gas resource base of the Caspian regione.” J. of Petroleum Science and Engineering, 28(4), 157-159. 9. Morillo, J., Usero, J., and Gracia, I. ( 2003). “Heavy metal distribution in marine sediments from the southwest coast of spain.” Chemosphere, 55, 431-442. 10. Duyusen, G., and Gorkem, A. (2007). “Heavy metals partitioning in the sediments of Izmir Inner Bay”. J. of Environmental Sciences, 20(4), 413-418. 11. Li, X., Shen, Z., Wai, O.W.H., and Li, Y.S. ( 2001). “Chemical fraction of Pb, Zn and Cu in the Sediment profiles of the Pearl River Estuary.” Marine Pollution Bulletin, 42(3), 215 - 223. 12. Yap, C.K., Ismail, A., Tan, S.G., and Omar, H. (2002). “Correlations between speciation of Cd, Cu, Pb and Zn in sediment and their concentrations in total soft tissue of green-lipped mussel Perna viridis from the west coast of Peninsular Malaysia.” Environment International, 28(1-2), 117-126. 13. Wong, K., Wong, P.P.K., and Chu, L.M. ( 2001). “Heavy metal concentrations in marine fishes collected from fish culture sites in Hong Kong.” Archives of Environmental Contamina and Toxicology, 40(1), 60 - 69. 14. Kamphuis, J.W., Davies, M.H., Nairn, R.B., and Sayao, O.J. (1986). “Calculation of littoral sand transport rate.” Coastol Engineering, 10(1), 1-22. 15. Lashte Neshaei, M.A. (1997). “Beach profile evolution in front of a partially reflective structure.” Ph.D. Thesis, Imperial College, University of London, England. 16. Lashte Neshae, M.A., Eslami, A., and Peiravi Chashnasar, M. (2006). “Sediment transport potential of the Caspian Sea.” J. of International Engineering, 2, 39-45. (In Persian). 17. Furness, R.W., and Rainbow, P.S. (1990). Heavy Metals in the marine environment, CRC Press, 256 p.
18. Luoma, S.N., and Rainbow, P.S. (2008). “Metal contamination in aquatic environments: Science and lateral Heavy metals mobility in harbour contaminated sediments: The case of Port-en-Bessin.” Marine Pollution Bulletin, 50, 504-516. 21. Adami, G., Barbieri, P., and Reisenhofer, E. (2000). “An improved index for monitoring metal pollutants in surface sediments.” Toxicological and Environmental Chemistry, 77(3 - 4), 189 -197. 22. Kesavan, K., Raja, P., Ravi, V., and Rajagopal, S. (2010). “ Heavy metals in telescopium and sediments from two station of velar estuary, southeast coast of India.” J. of African Marine Science, 26(1), 35-41. 23. Karbassi, A.R., Monavari, S.M., Nabi Bidhendi, Gh.R., Nouri, J., and Nematpour, K. (2008).“Metal pollution assessment of sediment and water in the Shur river.” Environmental Monitoring and Assessment, 147(1-3),107-116. 24. Wang, S., Jia, Y., Wang, S., Wang, X., Wang, H., Zhao, Z., and Liu, B. (2010). “Fractioation of heavy metals in shallow marine sediments from Jinzhou Bay, China.” J. of Environmental Sciences, 22(1), 23-31. 25. Demora, S., Sheikholeslami, M.R., Wyse, E., Azemard, S., and Cassi, R. (2004). “An assessment of metal contamination in coastal sediments of the Caspian Sea.” Marine Pollution Bulletin, 48, 61-77. 26. Hongyi, N., Wenjing, D., Qunhe, W., and Xingeng, C. ( 2009). “Potential toxic risk of heavy metals from sediment of the Pearl River in South China.” J. of Environmental Sciences, 21(8), 1053 - 1058. 27. Long, E.R., Robertson, A., Wolfe, D.A., Hameedi, J., and Sloane, G.M. (1995). “ Estimates of the spatial extent of sediment toxicity in major US estuaries.” Environmental Science and Technology, 30(12), 3585 - 3592.